Preparing for futures full of academic achievements. Our club-based Educational Programs are structured to help students succeed at every stage of education. From after-school and summer programs to supportive homework sessions, we’re focused on setting up every youth member for academic success. The Learning Centers at our Allied and Taft Clubs support the after-school program and summer camp educational experiences for students in grades 1 to 8. Learning center staff focus on engaging members in high-yield educational activities to help motivate and prepare students for a future full of educational achievement. The program promotes academic success, reading and math proficiency, skill building, an interest in STEM (Science, Technology, Engineering, and Mathematics), and college and career readiness. The ultimate goal of the Club is to equip every member with the academic and personal tools they need to graduate from high school and be prepared for college success. The program utilizes all components of Boys & Girls Club of Dane County education and career development programs. Home Room Zone is a feature within our Club-based afterschool programming at Taft and Allied. This program is used to emphasize a positive attitude toward learning. During Home Room Zone, all members are directed to complete homework assignments, focus on reading, or engage in educational games or activities. Home Room Zone is supported by lead teachers, tutors, and volunteers. Members are grouped by age to ensure grade-level appropriate reading and educational activities are provided within the 30- to 45-minute session, each day. 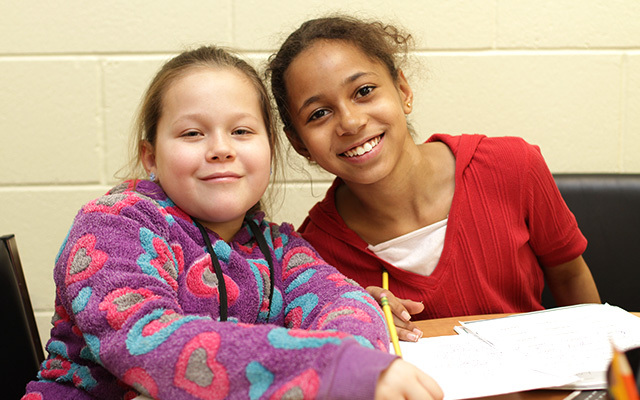 Homework time is scheduled into our after-school programming each and every day. Club members have the option to work with certified teachers, volunteers, and Club staff to get homework assignments completed and any questions answered. PowerHour: Making Minutes Count helps Club members ages 6 to 18 achieve academic success by providing homework help, tutoring, and high-yield learning activities and encouraging members to become self-directed learners. PowerHour provides regular and intentional programming to improve math and reading fluency. Members work with tutors to complete at least two after-school assignments each week. Diplomas2Degrees (d2D), a college readiness program, guides Club members as they work toward high school graduation and prepare for postsecondary education and career success. d2D helps teens develop both short- and long-term goals, while familiarizing them with postsecondary education through experiences like college tours. It also assists youth in securing financial aid and fosters supportive relationships with adults who can provide support throughout the college experience. Project Learn reinforces and enhances the skills and knowledge young people learn at school during the hours they spend at the Club, boosting their academic performance. This comprehensive program works with Club members ages 6 to 18 and is based on Dr. Reginald Clark’s research showing that students do much better in school when they spend their non-school hours engaged in fun, but academically beneficial, activities. Through Project Learn, Club staff use all the areas and programs in the Club to create opportunities for these high-yield learning activities, which include leisure reading, writing activities, discussions with knowledgeable adults, helping others, homework help, and tutoring and games like Scrabble that develop young people’s cognitive skills. Project Learn also emphasizes parent involvement and collaboration between Club and school professionals as critical factors in creating the best after-school learning environment for Club members. STRIDE Academic is an online personal learning platform that members may access to work on math, reading, and science lessons. Students spend at least 60 minutes per week using the academic instruction and activities to increase proficiency in math and reading. Students are supported by education staff, lead teachers, tutors, and volunteers. The 7 Book Summer program is a summer-based literacy program designed to decrease summer learning loss by designating time for reading books during the summer program.